Thank you again for an awesome day. You truly were a gentleman, professional and gave four outstanding programs for our children. You are one of many authors whom we’ve been blessed to have visit over the past 19 years, but certainly one of the BEST we’ve ever had! Having Bruce Hale come to our school was a delight. His inspiring story provided hope to struggling readers and his humor brought joy to us all. We would love to have Bruce return in the future. His personal story of transformation, from a TV-loving couch potato to an avid reader and successful writer, left us all inspired. His delivery, humor, and artistry will keep even the wiggliest kiddos engaged. We love Bruce Hale!!! Hearing from a published author about his own process validated the work students are doing. His visit brought together the key elements we hope to accentuate during Book Week — a love of reading, a love of writing, and a celebration of the stories that connect us. The visit was amazing and a total success from the students’ as well as teachers’ point of view. I highly recommend Bruce for a visit. Your students will come away motivated to read and be better writers. Our second graders had a blast. They are busy reading more of your books and writing their own stories. Your excitement for books was contagious! Bruce’s message of persistence, practice, and hard work to achieve one’s dream is a wonderful lesson that the kids will remember for years to come. Bruce was able to engage, inspire, and captivate even our most reluctant readers. He shared entertaining stories about his journey to becoming an author and the power that the right book can have in changing your life. Bruce…is a very good storyteller. He captivates the audience as soon as he starts his presentation, whether it’s kindergarteners or junior high students. We second graders loved, loved, loved Bruce Hale’s presentation. From laughing at Chet Gecko’s punny adventures to being inspired by Bruce’s own stories, we left this presentation filled with the possibilities of the imagination! Bruce Hale’s presentation is fantastic! He is very funny, and the students were totally engaged and thoroughly enjoyed his talk. Bruce is also great about sending packets with different activities and information about his books, which is so helpful in preparing the students and teachers for his visit. CPS was lucky to have author Bruce Hale visit today. A fantastic presenter, passionate about writing, and the kids loved him! Our students and teachers can’t stop raving about your visit! It was engaging, entertaining, and highly informative, but most of all inspiring, as many of our students now want to become authors! The kids simply adored you! You were engaging, funny, informative, and inspiring! It has been an absolute pleasure to work with you and I hope to have the opportunity to do so again in the future! Our school enjoyed a great day with Bruce Hale. The students were captured by his storytelling, and his positive message, to Dream Big, rang in their ears as they left. Mr. Hale was engaging and gracious. I recommend him highly if you are looking for an author to bring to life the work and the thoughts of an author. You clearly made such a positive impression on so many people, and we feel very fortunate to have had the opportunity to welcome you to our school. We all learned a lot, laughed a lot, and felt so inspired. He has a wonderful ability to tailor presentations for both the younger and older grades to make them relevant and engaging for all ages. Students left the assembly asking to read his books and understanding the idea that anything can spark a love of reading. Most importantly, Bruce inspired our students. In almost every classroom, children are talking about writing and illustrating and we have seen an increase of children in the “Author’s Chair” reading their newest work. It’s not surprising that the “Bruce Hale” books are now the most requested books in the library. If you want your students to get excited about reading, check out Bruce Hale! You have inspired many young authors, ignited a love of reading and reminded parents how important it is to read with their child; all in one day. Wow! We have shared, we have learned, we have laughed (sometimes so much that we have cried! ), we have persevered through power outages and bug bites, we have been inspired, and we have had an incredible visit! I heard from the teachers that your visit was the best ever by an author! One mom (and staff member) said that your visit inspired her daughter (in kindergarten) to become a better reader and she has been sitting her mom down every night so the student can read to her mom. After the Skype, ALL of the kiddos said they want to be an author/illustrator just like you! They were gluing pieces of paper together to make a book, they began sketching, coloring, cutting, talking about main characters…it was great to see them so excited! The students LOVED you! I think everyone of your books has at least 5 to 10 students waiting for it! Thank you for the wonderful presentation yesterday. In addition to being entertaining, I appreciate the focus on some important character traits, especially persistence. This is right in line with our belief in a growth mindset and that “effort grows ability”. Mr. Hale conveyed the importance of fulfilling dreams despite challenges and obstacles. As a result of his humorous perspective, the students were engaged and inspired to pursue dreams with passion, persistence, and practice. Bruce gave our students a day they will never forget! He inspired all of us to find the joy of writing and sharing your story through books. Two solid thumbs up for Bruce Hale. My students loved learning about how you write and why, not to mention all the personal touches you gave us! Thank you again and know you have made my students even more successful at reading! You were well organized and prepared, and you made planning the author visit feel practically effortless. I was particularly pleased with the rapport you had with the students during the book signing. Thank you again for making this an author visit to remember. Bruce Hale’s presentation was certainly a highlight of our BIG READ program. He is a delightful, exciting speaker who not only enthralled his audience with his words but also with his dramatic, musical, and artistic ability. The highest compliment I heard today was that you spoke to the kids at their level without “talking down” to them. My students were talking about it all day long. The dramatic story telling Bruce uses within his presentations resulted in students heading to the library to check out as many of his books as possible. 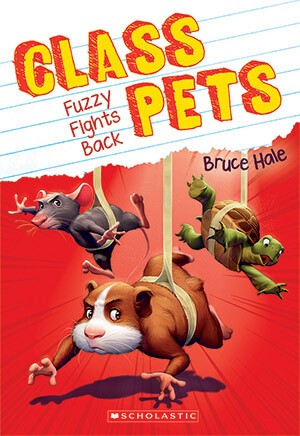 If you’re looking for a highly motivating speaker (especially for your reluctant readers), mystery solved – Bruce is your guy! It was an absolute pleasure to work with you on our Author-In-Residence program. Everyone loved you! I got tons of compliments from our teaching staff and we know that you inspired our students in so many ways. My son, Michael, commented last night that he wishes you were his uncle!! Our circulation department informed us yesterday that they received a lot of new customers over the weekend because of you!!! You have really made an impact, and we are so grateful to you for sharing your inspiration with these kids! Bruce Hale is a delight to host. He is flexible, kind and professional. I highly recommend him for library presentations. On behalf of the Libraries United Conference Committee, thank you for making our conference such a success. 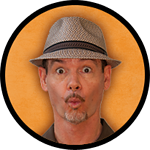 People loved your programs — the storytelling and writing workshops especially got rave reviews! They wanted more! We’d love to have you back to Maine for a future conference. Bruce was extremely easy to work with during the organization and implementation of authors’ week. The students and teachers absolutely adored him; they enjoyed his sessions because they were energetic, funny and educational. Your impact on our students’ reading is seen every day here — kids carrying your books around and READING them! Bruce is very easy to work with and has a wonderful personality for school visits. He is a great storyteller and easily holds the children’s attention. After the Author’s Faire, a special day student connected with him enough to go back to her room and reproduce all of his artwork, a gifted fifth grader spent the afternoon playing with language, and all over our neighborhood, children spent the weekend reading Bruce’s books. The [Battle of the Books] kick-off this year was fantastic, thanks to you. We had our best attendance ever, and for weeks afterwards people would tell me how wonderful your program was. It’s no surprise that for two weeks following your presentation, we were unable to keep Chet Gecko books on our shelves! Our students have been much more excited about reading since his presentation, and our librarian can’t keep Bruce’s books on the shelves. Our students have also become very excited about creating their own stories. Bruce’s talk has created many budding writers and illustrators. Overall, it was a wonderful experience for our whole school district, and I highly recommend Bruce Hale as a speaker. I wanted to thank you again for such a great visit…. I want to tell anyone considering having you speak at their school, they should definitely do it. You are wonderful with the students. If you remember, as you were leaving one student even begged you not to go! You were such a pleasure to work with — accommodating, organized, and always available to help. Many thanks for making my role in this so easy. He was an outstanding presenter and inspired our students with his message. If you are considering having Mr. Hale visit your school, I wholeheartedly recommend that you do so.